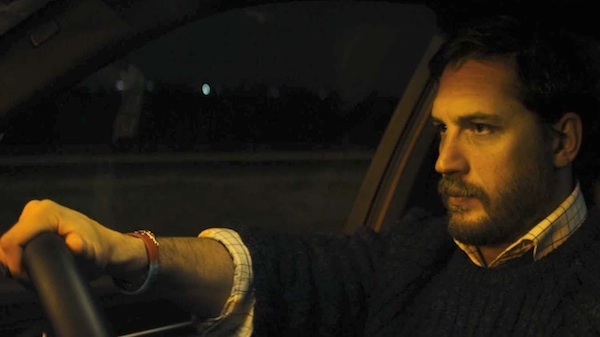 Locke, starring Tom Hardy–and only Tom Hardy–is being dubbed “Hamlet of the Highway,” and it’s exactly that. The premise of this one-actor film is simple and brilliant. The execution is also brilliant. A husband/father/expert construction foreman strayed once and only once in his marriage and got a middle-aged woman pregnant in a drunken one-night stand when he was working away from home. He has made a decision to “do the right thing” (according to him) and accompany this “fragile” woman (who has no one else in the world) as she gives birth. He is decidedly not in love with her. To add to his woes, Locke must oversee an historical (because of its magnitude) multi-million dollar construction operation remotely from his vehicle during the trip. The entire film is him: in his car, at night, driving to the hospital, placing and receiving hands-free phone calls through his dashboard computer. The many voice actors are so amazing that we think we have actually seen them onscreen and we don’t even realize there is just one actor that we ever see. We don’t get bored with the visuals–not only because of Hardy’s intriguing emoting, but because the camera is sometimes outside the car, the police sirens and menacing trucks and wooshing cars adding to the tension. The sparse and sparsely-sprinkled soundtrack is perfect. Locke is a rich “conundrum” and journey film. Did Ivan Locke (Tom Hardy) make the right decision? Does he make the right decisions all along the road? Should he have involved others in his decision? Was he actually acting selflessly or selfishly? What were his deepest motivations (the woman, the baby, being a better man for his own family, his own self-respect, because he’s a control freak, proving something to his dead father, putting people before things/work or work before people/things)? Did he understand what he was risking when he started out on the journey? IS this one deed really out of character for him? Or is it a hidden part of his character? Is it part of his bigger need to justify himself, and therefore everyone/everything is subordinated to that? It makes us really ask ourselves: what is really first in my life? When push comes to shove, what is really first? (Not what I wish was first or think is first or say is first.) Locke is conscientious. He’s reasonable. He’s capable. He does love his family. He’s a good man. But is that enough if everything has to be on his terms? I was hoping this film would be an ode to husbands/fathers/working men (for Father’s Day! ), but it is not quite that. I was alternately infuriated at Locke for what seemed to be his arrogance, cowardice and loutishness, and pitying him for his plight and even identifying with how he handled it. The question rises: How necessary is the truth when people don’t really want to know it? Is total transparency always the best answer? This is a man’s film if ever there was one, featuring all the burdens men carry, fall the things they are responsible for, the weight of “father,” the way men go about things, the way they get things done, the pride they take in their work, the many and varied gifts God has given them, the way they relate to other men, the way they relate to women, the collision of work and home, wanting good order, wanting things to go about “normally,” so many responsibilities, family heritage. We are true voyeurs in this film, watching this poor man’s every twitch, every use of tissue (he hasn’t slept and has a bad cold on top of everything). Are we supposed to judge him? Are we not supposed to judge him? It’s easy to follow his logic and see his point of view (as it is to empathize with everyone else on the phone, too). Does one out-of-character act truly define us (even though it can mess up the trajectory of our lives)? Or is it how we react, our pre-meditated second move that defines us? The Founder of my religious congregation, Blessed James Alberione, was kicked out of the seminary. Had he not been given a second chance, my life would be very, very different. And so would the world. Worse off. St. Patrick had an indiscretion in his younger years that people wanted to use to derail his becoming a bishop. Locke drives home the point how much each of us is in need of mercy. The filmmakers wanted Hardy and only Hardy to play this role. They couldn’t have been more on the money. His accent is unusual at first (a kind of Northern England thing that sounds almost Irish), but I got used to it. Sometimes his accent sounds decidedly working class, at other times snooty, but there’s always something soothing and calm about it. Is he trying to mollify himself ultimately? I won’t tell you if the ending is happy or sad or even hopeful because Sister wants you to see this worthy film. I personally am conflicted about the ending. It’s not what I predicted would happen, and I can’t tell whether I like it or not. Which might be a good thing in a film. Locke certainly raises many, many human questions.